Are you a pizza lover ? Have you ever tried making pizza at home ? If Nope ,So get started to learn making pizza at home , whether you have a microwave oven at home or not .That’s completely alright. But before that you need to note down the ingredients that you’ll be needing to make a yummy pizza on tawa . So, here we go. 2 tbsp oil (any cooking oil). Take a bowl and strain the maida in it. Add instant yeast to it. Take another bowl and apply ghee over it . Let it be there for 2 hrs. Cut baby corn in small slices too. Cook both of them for 2-3 min. Make a ball with half dough. Make a chapati of it with a thickness of about 1/2 cm and diameter 10-12 inch. Preheat your pan and place the chapati in it. Let it cook by covering it until the lower half gets brownish in colour. Flip it to other side and minimize the flame. Put capsicum and baby corn over it. Let it cook for the time being cheese get melted and the lower side of it gets little browner. Spread herbs of your choice over it . 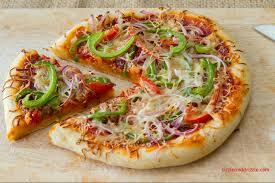 Try this new pan pizza at home and enjoy it ! Its very simple…. 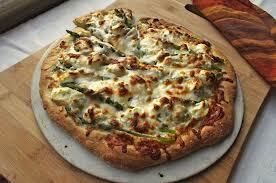 So nw we can make pizza at home….